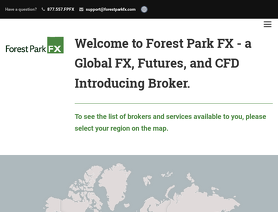 Forest Park FX | Forex Rebate IB Reviews | Forex Peace Army. Forex Park is amazing, They are extremely useful and responsive to any question. Always give me the best solutions with great patience bring me tailor made solutions. I also trust in your guidance always, I am a faithful follower. Justin and Trent are magnificent people, seek their advice. Justin at Forest Park is great. I highly recommend them over any of the others I've worked with. He does not just sit back and collect referral fees. Always been responsive, and is there to advocate for you if there is ever an issue with your broker. Forest Park Forex works in association with Aspen Trading. They are extremely helpful and responsive to any questions. They are very patient and will take time with you. They are always doing their best to help improve your returns. I would trust their guidance at all times.